Having been to a good few seminars where weapons (wooden sticks, that is) were part of the training, I have some thoughts to share. First, if you’re organizing a seminar, for heaven’s sake please be clear about whether participants should bring sticks or not. I have been left wondering many times, and either had to bring them just in case, or leave them home and hope they wouldn’t be needed. I’ve been wrong both ways. Please give abundant notice. I’ve been part of a large group flying to a seminar where we were all scrambling two days before the event to buy and/or build airline-appropriate carrying tubes. Given that we were trying to get other things handled before traveling it would have been a lot easier to have dealt with the stick-transportation problem weeks ahead of time instead of at the last minute. Not everyone has their own weapons. Sometimes there are loaners available, sometimes not, and often not enough to go around. The first seminar I went to was actually a retreat, and was to be fairly weapons-centric. I rush-ordered an inexpensive set of weapons (and basically had to refinish them on arrival – the night before the event) to be sure I would be able to fully participate in the weekend’s training. It’s great to have extras for participants to borrow. It’s a pretty iffy prospect for the participants, though. Maybe they’ll get one, maybe not. It seems there are always a few folks pantomiming what was shown, stick-less, during a seminar. It might be nice to specifically arrange loaners when people sign up. Another check box on the form: “Will you be [ ] bringing your own sticks, or [ ] need to borrow a set?” Dojo members or other local participants could help out by bringing any extras they have. Also, as a participant, I bring whatever spares I can carry from my own small collection. Someone has always needed to use them. Encourage people to bring any they can share. Just be sure they are clearly marked. No one would deliberately run off with another student’s weapons (right? ), but they could get them mixed up with the loaners or something. Make it easy for people to see who they belong to and return them. There’s also the risk that they could be damaged or lost. I have a decent inexpensive set for “away” seminars. My good ones don’t go on planes. Good thing, too – on this last return trip my sticks took an extra day getting home, and for a while there the airline seemed to have no recollection of them at all. Provide a local address (the dojo, a member’s business…) where out of town participants could ship their sticks (or other heavy, big, or awkward things like sleeping bags, extra blankets, etc.) so they don’t have to schlep them on a plane. If your dojo could use more sticks for general use in class or seminars, consider offering the option for participants to contribute to their purchase. For instance, buying a 10-pack of jo from some suppliers means the cost is very reasonable. If a visiting seminar participant could “rent” a bokken and jo for $25 it could potentially save them (net) $25 in checked baggage fees, plus a lot of hassle in getting their own weapons to the seminar. You’d have loaners for next time, and for your regular classes. After a few seminars they’d be fully paid off. Win-win! At one big seminar locally, where lots of people travel to be there, they used only tanto. Easy to pack, no special luggage required. 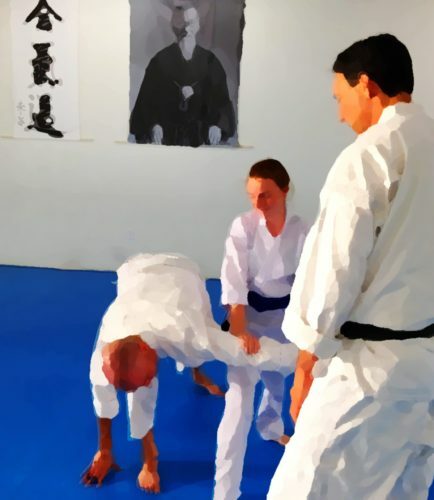 I thought that was a really thoughtful idea, and it was interesting to see how each of the instructors approached teaching with tanto. I’d love to hear any other ideas for making it easier for people to get sticks to seminars, too!